Share the post "Album review: JOE SATRIANI – Shockwave Supernova"
If the truth is that in recent years Joe Satriani has never quite eclipsed earlier offerings – his classic late-eighties albums with career-defining tunes – he can always be relied upon to deliver a very listenable and satisfying album. The thread from ‘Shockwave Supernova’ to those classic works is strengthened here with co-production by original collaborator John Cuniberti. It’s a given that Satriani’s guitar work is immaculate, the real test is the strength of the tunes. The sci-fi vibe is ever present but that’s what we’ve come to expect. We can take any idiosyncrasies when you hear tracks like ‘Lost In A Memory’, ‘In My Pocket’ and the wonderful ‘Keep On Movin”. As ever Satriani is joined by faithful keyboard stalwart Mike Keneally , bassist Bryan Beller and drummer Marco Minnemann and they provide the essential steady ground for his melodic excursions. Keneally is the perfect foil for Satriani on tracks like ‘On Peregrine Wings’, ‘Cataclysmic’ and ‘Stars Race Across The Sky’ whether providing atmospherics or harmonies or – as on ‘Scarborough Stomp’ – an almost Booker T good-time vibe. The final track, ‘Goodbye Supernova’ also features Keneally’s fine orchestration as well as a particularly absorbing Satriani solo. The spell of ‘Shockwave Supernova’ is only broken by the fairly perfunctory ‘San Francisco Blue’ but that is more than compensated by a track with the swamp rhythms of ‘All Of My Life’ or the infectious ‘A Phase I’m Going Through’. ‘If There Is No Heaven’ supplies more of the upbeat, lyrical brilliance that Satch does so well together with a rather appealing arpeggiated undertow. Where this album differs from the likes of Neal Schon’s latest offering is in the discipline of well defined song structures and in that respect all the better for it. They still allow Satriani the space for creativity in the soloing. 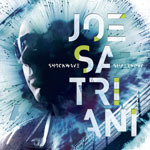 Joe Satriani’s new album ‘Shockwave Supernova’ is released by Sony Music/Legacy on Friday July 24th. This entry was posted in ALBUM REVIEWS, ALBUM REVIEWS (Mobile), All Posts and tagged album, guitar, guitarist, interview, Joe Satriani, Mike Keneally, review, rock, Shockwave Supernova. Bookmark the permalink.